I have another 45 minutes of calls (my last one turned me into a nerve wreck, because it was about a baby who was turning blue and could not breathe, and we had to tell mom to call 911! ), my blog post for the day is not up yet, I have 2000 more words to translate as soon as possible, I have started my translation class and the exercise, but I still have a guest post to write in English for another blog and I am past the deadline… But also, it was my birthday yesterday, and my husband and I are celebrating with a romantic date tonight, at a French restaurant 1h30 from here. I want to make myself pretty and have a nice manicure, but only one hand is painted. Right, I am so not out of the woods yet!! According to the blog Mon Expression, there are two potential origins to the expression. 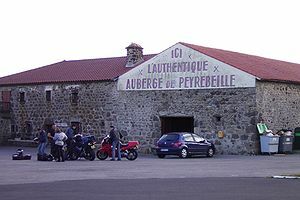 As you know, “Auberge” means “inn”, “hostel” or a sort of Bed & Breakfast but more like a tavern (i.e. with a full restaurant/ bar) usually. So why the use of “auberge” for a “difficult situation”? In the dictionary Petit Dictionnaire des Expressions Nées de L’Histoire, Gilles Henry relates that the expression originates from a criminal case in the Ardèche region of France in the early 19th century. The “Auberge Rouge” (Red Inn) had been a site of crimes happening over 26 years, committed by the host couple and their domestic to get rich off about 50 victims… Sounds like a Scarlet-type novel! The retired couple was found guilty of all suspected deaths in the area and their sentence to capital death with the oh-so-French guillotine was carried out in front of the Auberge Rouge with an accusation supported by only one witness… Apparently, the rumors surrounding the case inspired authors like Balzac, Chevalier, and later Autant-Lara. The alternative etymology suggested is that in “argot” (Parisian slang), “auberge” means “prison”; and indeed, a prisoner gets room and board in exchange for his captivity. So to “not be out of the auberge yet” would express the difficulty to overcome a situation of total confinement. Well, calls are slowing down, all 10 finger nails are painted in Sephora’s OPI “Make the First Mauve”, and I was able to give you a little history lesson along with a useful expression!